SUPERNOVA Digital Animation Festival is recognized as one of the most innovative platforms for visual arts in Denver, a singular forum for the public to experience a wide variety of creative advances in the rapidly evolving genre of digital animation. 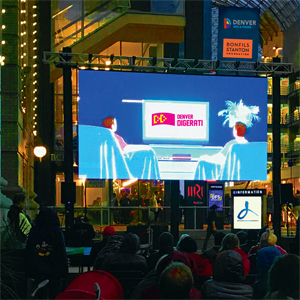 Taking place on multiple LED displays situated in the heart of the Denver Theatre District, including two feature screens with seating located in the Denver Performing Arts Complex Galleria, the Festival will showcase over 150 works of boundless imagination made by prestigious artists from across the world. Significant cash prizes are awarded by guest jurors to top entries in the Festival’s annual Competition, with an additional cash award determined by public vote for the Invitational Program, new in 2018. SUPERNOVA is a feast for the senses and a community experience unlike any other in the world today. Programs begin at Noon and run through the evening till 10pm, and are free for the public to enjoy! 12:00 p.m. - Reality Bytes! SUPERNOVA screenings at Denver Performing Arts Complex are free and open to the public. Find the full details at supernovadenver.com.